· HGV, HFV, TTV – viruses are insufficiently known. parenteral and vertical, sexual, micro traumas for HBV, HCV, HD, HFV and TTV; Susceptibility is high. ü receptivity - HAV 70-80 % (children elder than 1 year), HEV is probably high. ü receptivity is the greatest at children of early age, people elder than 30 years. 1. Inoculation of the pathogen (entrance gate – small intestine). 3. Viral fixation on hepatocytes, intracellular localization. 4. Primary replication of the virus. 5. Excretion with a goal to intestine. 6. Part of the viruses caused viremia (prodromal period of the disease). 7. Activation of immune system, that causes cytolysis, mesenchimal inflammation and cholestasis. 8. Immune response, elimination of the virus. 1. Inoculation of the pathogen. 3. Viral integration and replication in hepatocytes, also may be in blood cells, bone marrow, lymph nodes, spleen. 4. Activation of immune system, that causes cytolysis, mesenchimal inflammation and cholestasis. 5. Immune response, elimination or persistence of the virus. 4. Activation of immune system with low immune response. 5. Mutation changeability of the virus. 6. Persistence of the virus. Need virus hepatitis B for its replication, develops only in infected HBV patients. · alanine aminotranspherase, aspartate aminotranspherase may be enlarged. 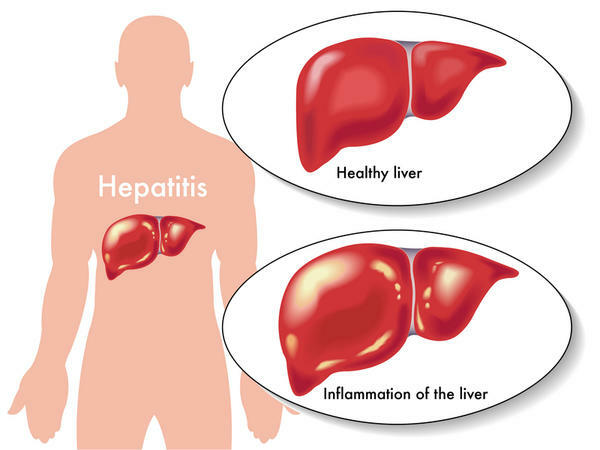 · Enlargement of ALAT and ASAT, urobilinuria, special hepatitis markers. · Jaundice of mucous membranes, sclera, and skin (photo). · Hepatomegaly (photo), tenderness of liver. · ALAT and ASAT are maximally enlarged. · Hyperbilirubinemia with conjugate bilirubin prevalence. · Enlargement of ALAT and ASAT, urobilinuria. · Anti-HAV Ig M, HAV-RNA (hepatitis A). · HBsAg, HBeAg, HBV-DNA and anti-НВс IgM (hepatitis B). · HBsAg, HBeAg, HBV-DNA, anti-НВс IgM and HDVAg, HDV-RNA (hepatitis delta coinfection). · Anti-HEV Ig M, HEV-RNA (hepatitis E). · HCV-RNA, anti-HCVcore IgM and IgG (acute hepatitis C). · Anti-HAV Ig G, HAV-RNA (hepatitis A). · Anti-НВс IgM , anti-Нве IgM, later- anti-НВс (total) IgM and anti-НВс IgG (hepatitis B). · Anti-НВс IgM , anti-Нве IgM, later- anti-НВс (total) IgM and anti-НВс IgG and anti-HDV IgG (hepatitis D). · Anti-HCVcore IgG (past hepatitis C). · Anti-HCVcore IgG, anti-HCV NS in hepatitis C latent phase. · Anti-HCVcore IgM and IgG (with IgM predominance), anti-HCV NS and HCV-RNA in hepatitis C reactivation phase. · Anti-HEV Ig G (hepatitis E). ü subhepatic icterus (mechanical jaundice). 2 wks. - 3 mo. 2 wks. - 6 mo. HBsAg, anti НВс,anti HDV IgМ. o Exclude heavy fats (like pork), spices, fried foods, "fast food"”; avoid stimulators of gastrointestinal secretions, the diet must be rich by metionine, lecithin, and choline to stimulate synthesis of proteins and enzymes in the liver. Diet with normal value of proteins and vitamins, with restriction of fats and carbohydrates is administered, also restrict salt. • Chophytol 1-2 tabl. 3 times a day. • Lactulose for 10-14 days. · Early isolation of ill person. · Looking after contacts, laboratory test every 10 – 15 days. · Disinfection in the epidemic focus. · Passive prophylaxis by human immune globulin. For hepatitis B active prophylaxis: after the birth, in 1, 6 months. When mother is HBs Ag positive – after the birth, in 1, 2, 12 months. A dedicated platform for all international medical research journals & medical articles.All our published journals are peer-reviewed academic and scholarly articles.